My goal is to be able to walk into a store that I like, try something on, and then buy it. Coates had stories of his own. During a semester he spent at Oxford, he and three other guys left class and headed to High Street to shop at some menswear boutiques. Each of his classmates (“all skinny, of course”) picked up shirts and blazers. Coates left with a pair of sunglasses. It was the only item that fit. 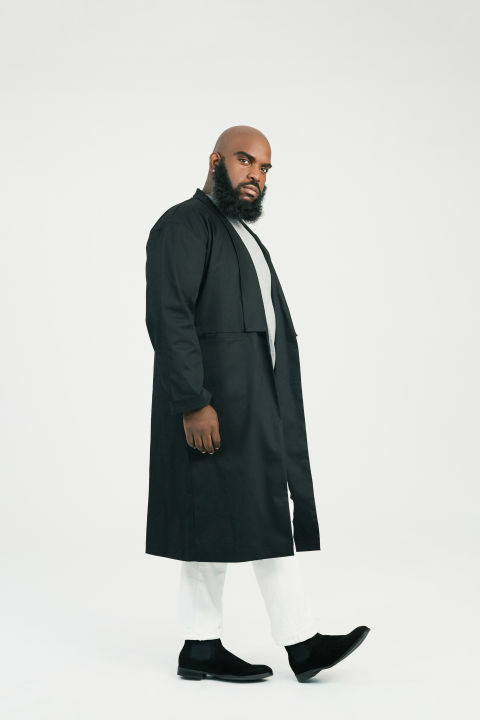 “Those experiences kind of piqued my insecurities,” he said, adding that in general, he is confident in his image as the “big boy who can dress.” But those experiences also piqued his interest in the plus-size industry. He knew, intimately, how underserved the market was. At a little table in the back of Panera, Coates pulled a pair of high-waisted camo-print pants out of his seemingly bottomless luggage. He told me to grab the fabric—”beautiful, heavy cotton”—so I took it between my fingers. It was substantial, sturdy. He laid the pants along his lap and reached down for the next item: a ponte (think: softer, thinner scuba suit) bomber jacket, black with epaulets and gold buttons. Next up, a tuxedo shirt with an intricate sequin bib, a pattern of blue, black, tan, and white stripes and zig-zags. Then a fishnet long-sleeve crewneck; convertible joggers that zip off into shorts; a lightweight blue and white tee with an attached skinny scarf. The t-shirt, Coates was surprised to find, was the first of his collection to sell out. Coates prides himself in the quality of his construction and the uniqueness of his designs. He knows plus-size men aren’t usually desperate for basics; they can find loungewear at the big and tall shops and discount retailers. What they can’t get are trends and high fashion, the kind of clothes that express personality. 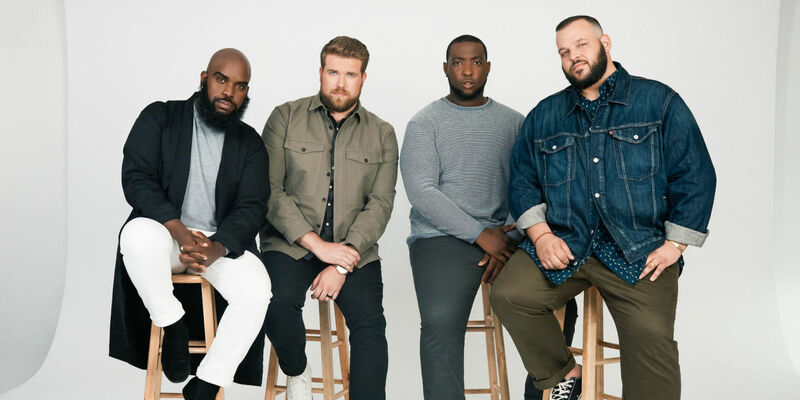 And if brands are assuming plus-size men aren’t looking to get experimental with clothes, that they wouldn’t appreciate a wider variety, that they don’t want to invest in their appearance, Coates is out to show them they are wrong. His first year in business has been proof. His line debuted at New York Fashion Week last year; since then, the Brandon Kyle newsletter—Coates’s main marketing tool—has grown by about thirty percent. He had to increase his size range to include large (it began at XL-4X) because non-plus guys were demanding it. In addition to his mini-collections, which come out monthly, he launched a resortwear collection for summer, comprising three trunks and coordinating dusters. Sales have risen steadily, and Coates expects the company to reach its break-even point by year two. I want to break down these misconceptions about what plus-size guys can and can’t wear.